Karina's Kreations: Groovy Love Thanks! I wanted to share with you one of my stamp set of the month cards using the Groovy Love stamp set. My ink colors are Blackberry Bliss, Crushed Curry and Lost Lagoon. I love that this stamp set coordinates with the Bitty Banners Framelits die. The greeting is from a new stamp set called Crazy about You. There are 30 different greetings. Put this set on your wish list. It you have a new mini catalog, check out pg. 31. Another fun item is the hearts and stars decorative mask. It's pnly $3.95 and has a big wow factor. 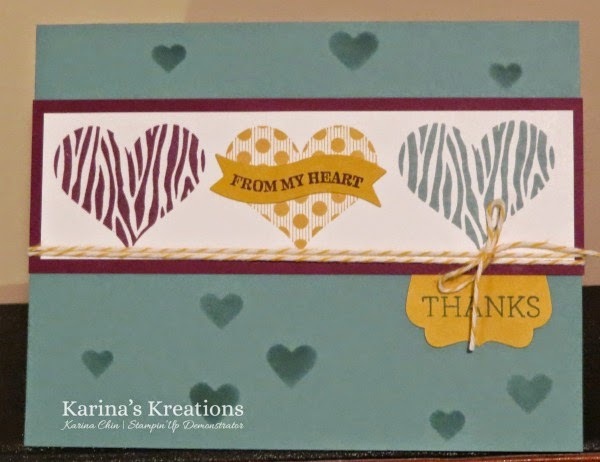 I used the lost lagoon ink on lost lagoon card stock to sponge on the hearts.